Lumpy or creamy, baked or fully loaded, mashed potatoes are the star sides of your Thanksgiving meal. 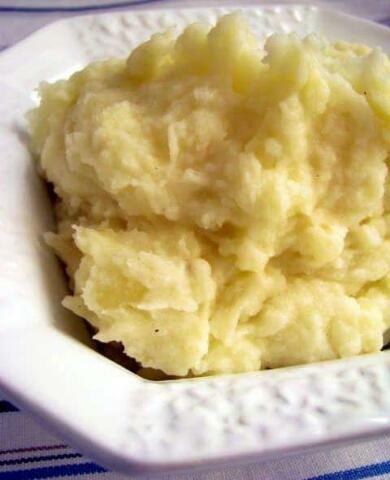 "My go-to recipe for garlic mashed potatoes. I like to add a little-seasoned salt while mashing. Also, don't be shy with the garlic." 6 Large potatoes peeled and cut into halves. ¹/₄ cup whipping cream or milk. 1 tsp butter or margarine. In a saucepan/sufuria/pot, place potatoes, garlic, salt. Cover and heat to boiling; reduce heat. Simmer covered 20 to 25 minutes or until tender (do not drain). Mash potato mixture with potato masher on low speed. In another pot/sufuria, heat ¹/₄ cup whipping cream/milk and the butter over medium heat, stirring occasionally, until butter is melted. Add cream mixture to potato mixture; continue mashing until potatoes are light and fluffy. Add additional heated whipping cream/milk for desired consistency. Stir and serve hot.